ver since it was founded, back in 2014, Typograph.Journal celebrates the creative process of the world’s best and brightest typographers, type designers, letterers, calligraphers, and printmakers. Typograph.Journal is a series of experimental 5x7 printed documents written by designers for designers. The journal blends design thinking and discourse, with curated ‘eye candy’, appealing to academics, professionals and students alike. The layout, visual devices and typographic treatment (form) reflect the content and thinking (function). The text is accessible, conversational and offers readers an authentic and engaging insight into each person and project featured. On the strength of the previous three volumes, the hotly anticipated fourth issue was released earlier this week. “Each volume of the journal starts with a question” says exclusively to TYPEROOM the type geek at the helm of Typograph.Journal, a renowned female typographic force herself with 16 years of professional experience in editorial design, visual communication, and art direction for the fashion, publishing and architectural industries. Nicole Arnett Phillips is currently working on a series of letterpress prints that translates letterforms between analogue and digital mediums. 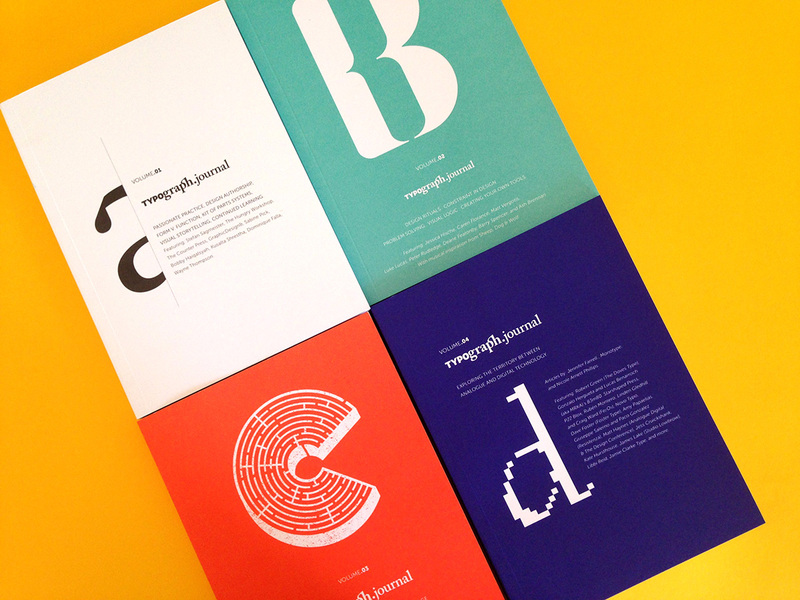 It was these visual experiments that sparked the content development for Typograph.Journal’s latest issue. “In volume 01 I wrote a manifesto for the Journal. In it, I assert it is important to look backward to move forwards and this fourth volume demonstrates how critical this point is whilst exploring the space between analogue and digital technology. Much of the most exciting and innovative contemporary design uses inspiration, forms, techniques and tools from previous era’s (or reinvents and repurposes old technology in new ways). Volume 04 shines a spotlight on creative’s who embrace technology in their work. We investigate the space between archaic design craftsmanship and today’s digital lead practices – we also look at some fascinating projects that combine both old and new mediums” adds Nicole who now balances her professional practice with her ‘passionate practice’ which includes self-initiated publishing, teaching, and printmaking. “In recent years, the design community has re-connected with slow media. Contemporary creatives embrace letterpress, calligraphy and working with their hands. (Nicole unashamedly admits there is a large letterpress focus in this volume!) We are once again recognizing the value of traditional craftsmanship and honoring simple tools and processes. But we are not entirely steeped in nostalgia. Designers love emerging technology too! Typograph.Journal volume 04 examines expressive digital mediums that reference human gestures and the human condition. The content is not so concerned with the technicalities of the digital realm but rather the ideas that might redefine its boundaries or the way we practice and create”. The lead article in this volume focuses on Robert Green’s journey, tenacity (and obsession!) with translating printed specimen of the Doves Type into the digital realm. Other key features include; Novo Typo’s Bixa, which reverses typographic history by moving against the development of technology. 83m80 which celebrates the constraints of digital mediums in a printed format. P22 blox which uses cutting-edge plastic molding to revive an early modular font (originally cut in woodtype) for today’s letterpress community, Fe2O3 which uses space-age science to produce a new visual language. Amy Papelias’s spoken and living type specimens and many more amazing (and inspiring!) projects. “The pathways we take in our creative process, and the tools we use when creating inform who we are as designers” she adds. This publication aims to serve a growing global scene of type enthusiasts. Typograph.Journal showcases exemplary work, analyses design process, and shares ideas through accessible and concise articles. Limited to 1000 Copies Typograph.Journal is available to purchase here.